Why Switch to Solar Energy ? Perth, Western Australia is one of the best places in the country to install a solar power system. 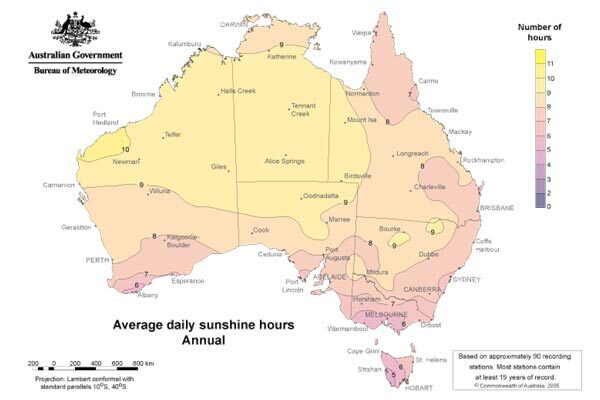 WA has now officially outshone Queensland as the nations “Sunshine State” with recently released Bureau of Meteorology data showing that Perth is now the sunniest State capital with a long-term annual average of 8.8 hours of sunshine a day. Ahead of Darwin (8.5 hours), Brisbane (8.2 hours), Adelaide (7.7 hours), Canberra (7.7 hours), Sydney (7.2 hours), Melbourne (6.5 hours) and Hobart (6.4 hours). It’s these long daylight hours that can really boost the output of your solar power system and create a generous amount of power for you to either use in your home or export back to the grid. Under the Governments Small-scale Renewable Energy Scheme, eligible small-scale renewable energy systems are entitled to a number of small-scale technology certificates (STCs). The number of small-scale technology certificates that can be created per solar system is based on its geographical location, installation date, and the amount of electricity in megawatt hours (MWh) that is generated by the small-scale solar power system over the course of its lifetime of up to 14​ years. This means that, In Perth, for a 6kW system you can receive STCs to the value of around $4,000 which will cover roughly 50% of your install cost. Power prices in Perth are high and on the rise, a recent Australian Energy Market Commission report (Dec16) has forecasted the average price of electricity to grow by 14.5% over the following 2 years. That’s an increase of nearly double the national average over the same period. With power prices increasing this fast, this means that you stand to gain even more from your Solar Power Installation, meaning it will pay for itself in even less time. Perth’s unique combination of lots of sunshine, high and increasing power prices and generous government incentives makes Solar Power one of the best investments for your household or business. Contact us now for an obligation free quote.